Delayed-onset muscle soreness, or DOMS, is a common cause of pain after a workout. The pain from DOMS can often last for several days, and nothing has been found to consistently prevent it although there are precautions that can be taken. Knowing the signs and symptoms of DOMS can help differentiate it from an injury, which is more damaging to the body. There are several treatment options, but only a few that are widely recommended. 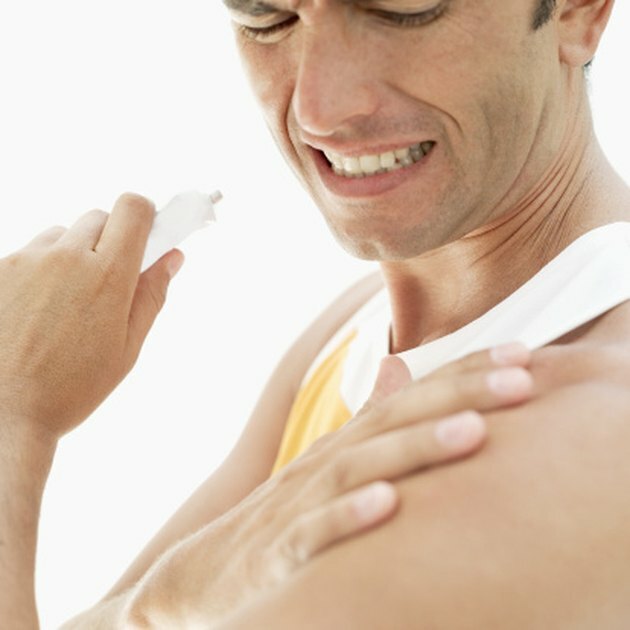 If you are experiencing severe soreness, or if the soreness lasts for more than seven days, contact a doctor. The soreness that results from DOMS usually sets in 24 to 48 hours after exercise. In addition to pain, DOMS can also present with symptoms that include muscle tenderness, stiffness, loss of strength and swelling, according to researchers at the University of New Mexico. Not all the symptoms are present at the same time, and you may not experience all of the symptoms. The pain usually peaks after three to four days and goes away after three to seven days. Stiffness and swelling can last the longest, sometimes not disappearing until 10 days after a workout. There is no consensus on what occurs in the muscles to cause DOMS, but the most recent theories suggest it results from micro tears in the fibers of the muscle that occur when they are strained. People who are just beginning an exercise regimen and overexert themselves when working out often suffer from DOMS. More seasoned athletes can also have DOMS, often when they increase their workout duration or frequency or work muscles they don't normally use. One thing that has been noted is that DOMS results more from eccentric exercise -- resistance against lengthening of the muscle -- such as lowering a weight when doing a biceps curl. Concentric movement -- resistance against shortening of the muscles -- does not seem to be a factor in DOMS. There is not a whole lot of consensus as to what most effectively treats DOMS, despite the numerous studies done, according to the American Council on Exercise. No therapy that consistently increases the speed at which DOMS is relieved has been found, but some therapies may work if applied right after exercise. Non-steroidal anti-inflammatory drugs, such as aspirin or ibuprofen, may help relieve pain. Gentle massage on the affected muscles can possibly offer relief. Using a hot pad or soaking in a hot tub can help soothe the muscles temporarily. Sitosterols -- plant sterols -- and protease enzymes can help reduce the inflammation associated with DOMS, according to Clayton South at BodyBuilder.com. Trypsin, bromelain, chymotrypsin and papain are examples of protease enzymes that can affect DOMS, according to South. Be aware, NSAIDs can adversely affect the gastric system so should be used sparingly. Consult a doctor before taking any supplements such as the protease enzymes. One of the best way to reduce DOMS is by avoiding the possibility of getting it, and the best way to do that is by respecting your limits. If you are just beginning an exercise program, start slowly and gradually increase your workout duration and intensity. The American Council on Exercise, for example, recommends beginning weight lifters exercising with light weights, two to three times per week for one or two months, then gradually work their way up to heavier weights. More seasoned athletes should do the same when beginning new routines. A warm up before exercise will help reduce the symptoms of DOMS if it occurs. Do a warm up to increase blood flow, such as light jogging, for 10 to 15 minutes and move the muscles in the same way you will when working out, imitating the motions that you will be performing. Working out with DOMS will not cause further damage to your body, but it is not recommended. However, working out with an injury will cause further damage so it's important to recognize the difference between the two. Injury will usually have more severe pain than DOMS and will be worse with movement. DOMS will usually go away once your body adjusts to the increased activity, whereas the pain from injury will be worse. Consult a doctor if you suspect injury or if the pain doesn't go away after seven days. If you have severe pain, or other symptoms along with the pain, such as a fever, seek immediate medical attention. My Legs Are Sore From Squats: Can I Still Work Out?